There’s no denying that majority of us spend a lot of time on internet. A web browser makes it possible for us to interact with the websites easily. Google Chrome, apparently, is one of the most popular web browser and there are justifiable reasons for the same. However, while browsing, Google Chrome throws a “waiting for available socket” error, which annoys the hell out of me. After talking to some people I found out that I’m not alone and quite a few people face this error. 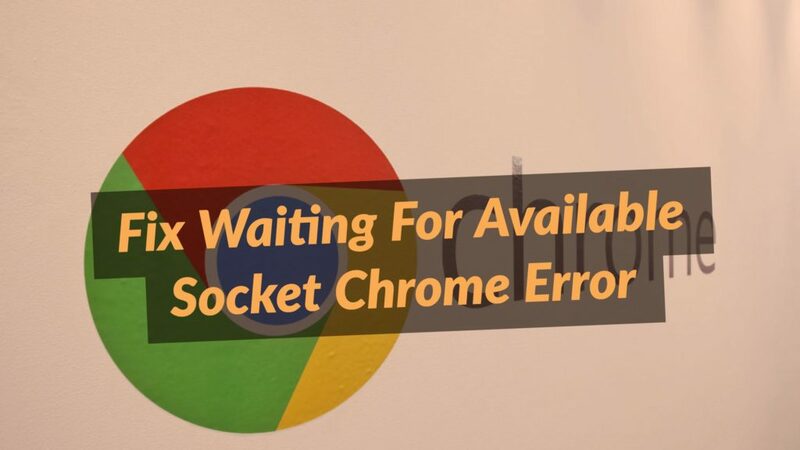 So, I thought why not write an article on how to fix waiting for available socket Google Chrome error. After peeping through many solutions, I picked up a convenient reasoning which can explain this waiting for available socket error. More of often than not, this error in Google Chrome occurs when you open too many image windows, which hangs up the Google Chrome. Usually this error is visible at the bottom left corner of the browser window. There’s a good chance that your socket connection has been overloaded. There are many possible cases due to which the waiting for available socket error pops up. However, the solution to this error is really simple & I’d like you guys to follow me here. Start “Google Chrome” & write the following command in the URL bar : “chrome://net-internals”. There will be a drop down menu, which you need to open and select “Socket”. Just click on the “Flush Socket Pools”. This will flush all the current sockets and you’ll be able to use the Google Chrome fluently again. As much as I like to say that this method should solve the waiting for available socket error, I like to provide a backup method for my readers, always. So you could try the below method as well it the above one seems to be difficult. Start Google Chrome & open Settings. Here go to the History section. Just select “Cookies & other site data” and “Cached Images & files”. Now click on the “Clear Data” and you’re good to go. The method might be different but the process which goes behind it is same in both the cases. You need to get rid of the jammed sockets to start a fresh session. I’m sure that these 2 methods will help you solve the waiting for available socket Google Chrome error. If there’s any confusion or query, let us know in the comments.